Happiness: what would it look like if it was easy? While a booming self-help industry has overwhelmed us with an abundance of well-intentioned advice on how to become happier instantaneously, lack of systematic approach and empirical basis in many of the methods used to improve well-being has proven to be a futile attempt in creating lasting change in behavior. So if you’re tempted to simply skip through to the activities in this article, think again! And choose wisely. So you attempted some random happiness boosting activities and they didn’t stick. Maybe you tried to change everything all at once and became overwhelmed and discouraged. Perhaps you even made yourself miserable chasing after happiness in all the wrong places (Gruber et al, 2011). Science shows that many of us revert back to a set point of life satisfaction. But why? As those who have fallen in love or won a lottery can attest to, over time we all return home to that familiar level of contentment and our old self that fits all too well. 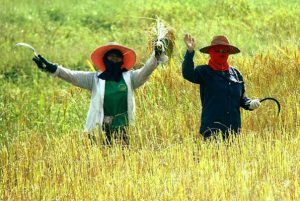 As Parks, Schueller and Tasimi suggest in The Oxford Handbook of Happiness, what we need instead is a field of empirically supported self-help (ESS-H) rooted in research-based materials accessible to the wider public searching for proven techniques to increase happiness (2013). Well established research in positive psychology (Parks, Schueller and Tasimi, 2013) shows that a lasting change in levels of life satisfaction depends on combining activities from at least 3 key areas of well-being that include enjoyment, engagement and meaning and can be sustained by picking techniques that encourage motivation, or simply put those that you will enjoy and persevere in. 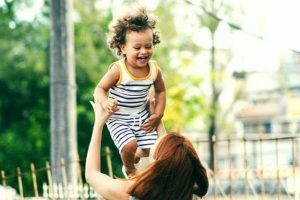 To help guide you in choosing interventions, we begin every section by reminding you of the importance of fit and by briefly introducing a proven happiness theory that outlines the components necessary for enhancing well-being effectively. Happiness activities work better if they align with our interests, goals, values and personality according to Sheldon and Lyubomirsky (2006) who propose the idea of “fit” when implementing exercises to boost life satisfaction. Preference proved to be an important consideration in Schueller (2010) study where a participants’ self-reported inclinations toward a technique determined the number of days they engaged in the assignment over a week period. Similar approach was taken by Parks (2012) whose subjects tried a variety of exercises first and then chosen one or two to continue practicing. This approach allowed them to be exposed to several techniques instead of relying on their initial impressions of what may or may not be helpful for them, and then having tried them select what they prefer to engage in. When it comes to happiness-increasing strategies, flexibility is crucial for achieving success, but so are realistic expectations. 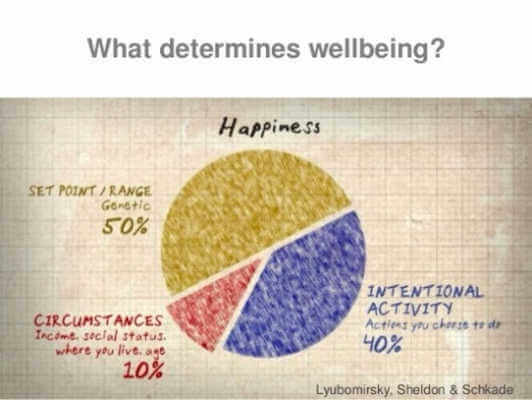 Research done by Lyubomirsky, Sheldon and Schkade shows that 50% of our range (or set point) for levels of happiness we can experience is determined by our genetics (2005). The good news is that only 10% are determined by our circumstances (like our age, income, or social status) leaving us with a 40% chance of taking intentional action towards improving our sense of life satisfaction. Three empirically tested and validated paths by which happiness can be increased, according to Duckworth, Steen, and Seligman (2005) are: pleasure, engagement, and meaning. Endorsed by hedonic theories of happiness, the pleasant life is a dimension of human experience that consists of experiencing positive emotions about the past, present and future. Positive psychology interventions teach us skills to amplify the intensity and duration of these emotions. Positive emotions about the past can include pride, fulfillment, satisfaction, contentment, and serenity. When we feel good about the future, we often describe it as hope, optimism, confidence, faith, and trust. In the present we experience positive emotions through savoring and mindfulness. The engaged life is a dimension of happiness that relates to the pursuit of involvement, engagement, and absorption in work, leisure and relationships. Stemming from Csikszentmihalyi’s (1990) work on flow, the notion of engagement is exemplified by a person experiencing the psychological state brought about by such intense concentration that it results in temporal distortion where we lose sense of time. This true involvement is possible when our skill levels are sufficient to meet the challenge of the task and is often described as being “at one” with the experience. The meaningful life is the third dimension of Seligman’s conceptualization of happiness and is concerned with the pursuit of meaning. Victor Frankl (1963), who pioneered the study of meaning, emphasized that simply desiring happiness will not lead to its attainment and argued that true happiness comes as “the unintended consequence of successfully pursuing activities that connect us to larger goals. When you choose from happiness increasing activities listed below keep this mind and while you may decide to pursue only one technique that satisfies all 3 key areas of meaning, engagement and enjoyment, remember to have realistic expectations, consider what motivates you, and if you’re trying something new, practice for at least a few days. Oxytocin: The Hormone of Trust. Spend time visualizing and feeling appreciation, love and affection for people you care about. Just thinking about the person isn’t enough; feeling the “closeness” facilitates the emotional and hormonal shift. Fear: Why it Feels Good to Worry: Use your brain’s desire for novelty seeking and future-mindedness to think of things that you want instead of what you don’t want. You’ll get a similar dopamine release in your brain, feel less stressed out and most importantly, your brain will focus on manifesting what you want. Make Friends: You’ll Live Longer. Make social connection a priority. Create more space and time in your life to do things that are meaningful for you and connect with others who do the same. Savoring: The Deliciousness of Life. Withdraw from your sense of sight and increase the experience of your other senses. Have a friend blindfold you and walk you around town, feed you a meal or sit with you in nature. Your Work: Job, Career or Calling? Make a cognitive change: Change your perceptions of your work. How does your work affect the world at large? How is your work a necessary part of a great functioning whole? Exercise: Mammals Have to Move. Create opportunities to turn daily activities like climbing stairs, cleaning and walking into exercise. Make it brisk and invigorating! Breathing: For Calm and Health. In for 5 out for 5, is encouraged by Stephen Elliot in his book, The New Science of Breath. Inhaling for a slow count of 5 and exhaling for a slow count of 5 brings you down to 6 breathes a minute where most people usually breathe 15. Primers: Counter Out of Sight, Out of Mind. Leave voicemails of your own voice reminding you of your goal. Self-efficacy: Beyond Self-Esteem. Recognize that self-efficacy is a spiral of self-fulfilling prophecies. When you have positive expectations for your abilities, you’re more likely to accomplish your goals. In accomplishing goals, your self-efficacy increases. In the following sections we give more examples from various sources for increasing happiness arranged into the 3 pathways as defined by Seligman (2002) and then provide an overview of more comprehensive techniques based in positive clinical therapy and positive psychology coaching. A full life entails a pursuit of pleasure, engagement, and meaning, through separate activities or through a single intervention. To increase our contact with positively rewarding activities and improve our chance of being able to experience flow we can employ the technique of behavioral activation where we identify specific goals for the week and work toward meeting them (Kanter et al, 2010). These goals should be consistent with the life we want to live and involve at last mildly enjoyable activities. Celebrate and reward your progress. 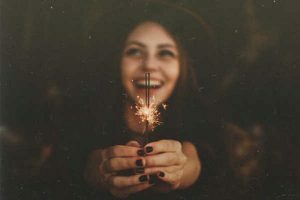 Positive clinical psychology offers some very useful and well-proven techniques to increase happiness that also employ positive emotions, character strengths and pursuit of meaning while addressing psychopathology. Positive psychology interventions are used in conjunction with therapy to “build-what’s-strong” while addressing “what’s-wrong” (Duckworth, Steen, &Seligman, 2005). We know today that the effects of negative emotion which often contribute to psychopathology can be “undone” by building on positive emotions (Fredrickson, Tugade, Waugh, & Larkin, 2003). Cultivation of engagement with important aspects of one’s life including work, relationships and leisure not only improves well-being but also contributes to increased resilience to stressors present in lives of clients who seek treatment (Csikszentmihalyi, 1990). Clients undertake complex activities that use their strengths to help them combat the manifestations of disrupted attention and fight tendencies toward rumination. Pursuit of meaning can be accomplished through activities that connect clients to goals larger than themselves and their conditions. It’s important to notice that any one of the activities listed below could in fact satisfy the pursuit for meaning while being engaging and generating positive emotions. The concept of full life is explained as an integration of enjoyment, engagement and meaning and ways of sustaining positive change in the future are devised. Be Better Using Your Best. Think of what you are most proud of. You were probably at your best in that moment. Observe the spike in energy you experience as you talk to someone about it. Create a New Strength. Think of your peak performance moments and come up with a few labels for the strengths that you exhibited. Observe them in yourself for a week and name them as you notice that you’re employing them. Strength Spotting is a great way to become more aware of strengths of other people. Be on the lookout for signs like rising inflection, use of metaphors, smiling, wide eyes, hand gestures, better posture, rapid and more fluent speech. Strengths in Clients. Ask what they are looking forward to in the near future. Your clients are likely to tell you something about themselves that highlights their strengths. What Went Well for Others. Recall a positive thing you witnessed in others like someone taking an initiative. Reflect on how it makes you feel and ask yourself what that feeling makes you want to do yourself. Ideal Self. Imagine yourself in the future having gotten to all the things you want in life. Describe in detail what your ideal life looks like. Then think about skills you used to get there and reflect on these as current opportunities for growth. Vividly picture all the decisions you need to make that will help you achieve that goal. Reflected Best Self exercise requires that you collect feedback about your peak performance moments from others around you. It will give you a fresh perspective on your strengths and how you use them. Write your Mission Statement that reflects your values and strengths and think about specific ways in which you will employ both to achieve a goal that is meaningful to you. Possible Selves at Work can be used to find new meaning in your work. Imagine yourself at work where everything went as well as it could? What kind of person would you be? Ask how far away you are from being that person right now and what small thing you can do today to get there. Employ Terror Management Theory to rethink your life and find new meaning in it. No one likes to think about death, but it is not a bad way to see why you and others may be defensive when reminded of our mortality (2010). Address skepticism and misconceptions clients may have about introduced interventions; consider clients’ preferences to maximize adherence; and take into account their lifestyle to improve sustainability. It would seem that the recipe for a happy life could be boiled down to a simple equation that represents the sum of living a pleasant life via cultivating positive emotions, the good life via full engagement in what we do, and the meaningful life via connection to purpose. Unfortunately, as many as 80% of all Americans fall short of the 3-to-1 positivity ratio that predicts flourishing (Fredrickson, & Joiner, 2002). Below you will find more exercises for building upon happiness through cultivating positive states of mind, absorption and meaningful pursuits. Start small and remember that liking is crucial to sustaining motivation. Consider that frequency is often more important than intensity or duration, and keep in mind it’s always better with friends. Sustain the Memory of That Good Thing for 20 seconds in your consciousness to release the positive neurotransmitters, and to further increase it share it with someone. Daydream and do some mental time travel. Quoidbach et al. (2008) found that positive mental time travel can be very effective in increasing positive emotions in the moment. Counting Kindness: Keep a log of acts of kindness and write them down at the end of each day. Observe how your ability to notice them increases and challenge yourself to perform them more often. Mentally Subtract some good that happened to you and observe how much more you will appreciate it. Give a Heart to Heart Hug (go in on the right side, so your hearts touch) and hold hug for 20 seconds to release oxytocin (Brennen, 2013). Laugh, when sustained for 20 seconds or more laughter has a very similar effect as hugs or savoring (Yoshikawa et al, 2008). Three Funny Things: write down a few experiences that made you laugh or even giggle. Pay particular attention to those you were a part of. Act Happy. Acting happy can make you happy so smile and adopt an open or relaxed body language position. Move happily too, with a spring in your step and with relaxed swinging of your arms. Verbally align also. Speak like you are happy, using more positive words like ‘love’ and ‘great’. Refer to yourself less and others more. Vary the pitch of your voice, especially avoiding a monotone. Speak clearly and nod in agreement. 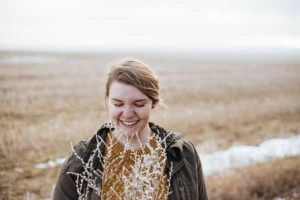 Research by McIntosh (1996) shows that if we sustain this form of positive expression for at least 15 to 30 seconds it can elevate our overall mood. Happy Posture. Dr. Paul McKenna has this interesting suggestion: standing or sitting straighten your posture and imagine a silver threat from the sky pulling you upward from the top of your head. Relax your shoulders and feel your back being lifted by your neck, relax more with every breath and keep imagining the thread pulling you up for at least one minute. Look Away from Negativity: Fix your gaze on the sky or horizon whenever you find yourself looking down and move your eyes from side to side. Observe how it breaks the pattern of thinking and gives you a sense of openness. If you’re really enmeshed in negative feelings look up and down 20 times and even move your eyes as if drawing figure eight. Reframe Desire. Notice how you constantly create desires. Do an audit of your current wants and desires, from what you will do this evening to what you want from your job and life. Write these down. Many people can make a very long list. Now question seriously: Do you really need all of these? What will be the cost to you of achieving them? Think also of the past. What has led you to be enduringly happy? Also think about the things you have now. Do you desire them? What if you did? (ChangingMinds). Positive Reversal. When you are feeling negative about something or someone, reverse your position and make a positive argument for the other side. Make the reverse argument genuine and heartfelt. Avoid cynicism by considering how it makes sense and seems realistically fair to the other side. To make it seem unfair, we tend to polarize our arguments, making ourselves totally right and other completely to blame. 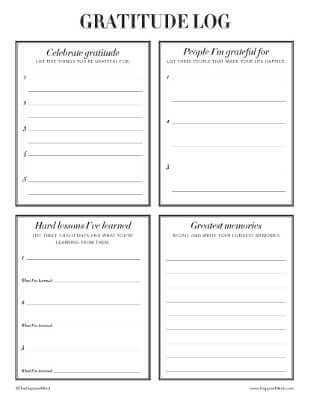 Keep a gratitude log like the one below, courtesy of the Happier Mind journal. Engagement, the second component of living a full life is best practiced when drawing on character strengths like creativity, social intelligence, and perseverance and is defined as pursuing experiences that are intensely gratifying where there is no reason for doing them except for the experience they provide. Prof. Csikszentmihalyi argues that the secret to a happy life is to learn to be engaged in as many things we have to do as possible. Discover and cultivate your passions. Dr Robert J. Vallerand in his book Psychology of Passion discusses many of the effects of passion on emotions, relationships, and performance. Learn something new and enrich your life. So whether it’s yoga, meditation, or gardening, try to be in a state of complete absorption when acquiring new skills and knowledge. Take a Free Online Course. Use a website like Alison.com to learn a new skill for free. Coursera and edX have great free offerings as well. and finally, if gridlock seems unavoidable, figuring out if a temporary compromise is needed. The third aspect of human flourishing (“The Meaningful Life”) has to do with having a sense of purpose which is forged by pursuing something larger than ourselves and is often known as an antidote to what some call “fidgeting till we die” syndrome. Finding meaning in our lives is tied to knowing our core values and what we stand for. When our goals are connected to our values it becomes easier to make choices that reflect our higher good, especially in difficult situations. Letter to Your Future Self. Write a letter to yourself and open it on a specific day in the future, it could be your birthday or another milestone. Research in the area of prospections has shown the importance of how we think about the future on our current well-being (Baumeister, Vohs, & Oettingen, 2016). Personal Mythology. Create a story using the following form: “Once upon a time there was a _____ named _____. It was very _____, _____, and _____. It lived in _____ with ______. Every day it would _____. It’s favorite thing about its life was _____. Its least favorite thing was _____. More than anything, it wanted _____. The only problem was that _____. One day, it was _____, when suddenly _____.” Continue the story to completion and write, “The End.” Discuss if and how the main character solved its problem. One Door Closes, Another Door Opens. Consider a moment in your life when a negative event led to positive consequences that you were not expecting and write about it. Finally, if you’re a positive psychology practitioner, maybe your lifelong goal is to answer to Dr. Seligman’s challenge and contribute to his mission for positive psychology to bring the percentage of people who are flourishing to 51% by the year 2051. Share it with us in comments below. Positive Inception is about transferring our positive reality to others (Achor, 2013). In Christopher Nolan’s film Inception main character Cobb played by Leonardo DiCaprio is hired to plant an idea, an inception, into his targets’ subconscious while they sleep. For inception to be successful, the idea has to be simple and emotionally charged but most of all positive. Although the events in the movie are fantasy, latest research in positive psychology shows that subconscious is motivated by emotion not reason and that positive emotional concepts take root better than negative because they create lasting change (Achor, 2013). Hence the metaphor of positive inception and the explanation why positive realities are easier to transfer to others than the negative ones. We cannot force others to see the world in positive ways, but we can still plant seeds of positive realities in their brain. Success Franchising is coming up with a positive behavioral change that is easily replicated. We are told that any success that can be observed can be repeated thanks to mirror neurons, those receptors in out brain that cause us to unconsciously mimic other people. The example of this form of positive inception could be found in Ritz Carlton’s 10/5 policy that requires their employees to smile at everyone who is within 10 feet of them and greet everyone within 5 feet radius. Script Writing is about changing a prevailing social script by making it positive and therefore increasing one’s social influence. This can be done by using a “power lead” and utilizing humor. Example of a power lead evolves around speaking first. The first statement in any dialog has a big impact on the tenor of the whole exchange. For example, you’re talking to a friend who is struggling. If you allow them to start by complaining the entire conversation will be about her struggle and your sympathy. But if you were to remark that she looks better than the last time you saw her or ask her about something positive in her life, you can re-write the script of that entire interaction by taking the “power lead” and injecting the positive at the start. Creating a shared narrative is about creating value and meaning by appealing to emotions. For example, if I wanted to relate to a group of folks who struggle with being comfortable with public speaking, I would talk about how I flapped last time I delivered a speech, about how nervous I was and would ask for advice and feedback. When choosing happiness activities beware of indecision as it can be detrimental and cognitively exhausting. It is also important to match your mood with activity. if you are feeling, sad, down or depressed, seek the comfort of the familiar. If you are more upbeat, then seek the stimulation of the new and unfamiliar. When we are unhappy with where we are, it can be a temptation to move or emigrate. But when you do this, everything becomes unfamiliar, which is not the right treatment for a sad person. Visiting old friends is a better solution (de Vries et al, 2010). So depending on whether you’re looking for a quick pick me up, want to expend your repertoire or looking for a more robust approach to get yourself out of a funk, you’ll find the answers below. Try unfamiliar and new activities and don’t disqualify a new approach unless you’ve tried it for a few days. Remember the simplest and most effective approach is to address 3 areas of well-being: enjoyment, engagement and meaning. Remember positive information with this activity from GGSC that boosts positive memory. Flower helps you experience what it is like to float on the wind. “Ho’oponopono” is a Hawaiian warning against acting rashly when wronged by someone and taking time to address things calmly through taking a deep breath, considering perspectives and working toward forgiveness. “Ubuntu” in Nigeria is about putting community first. The science of happiness is said to have three distinct components: positive emotion, engagement and meaning, all of which can be increased in specific ways to contribute to a sense of living a fuller and more satisfying life. The PERMA model popularized by Dr. Martin Seligman, also includes relationships and achievement. Our need to connect is essential to our survival as a species but it is often dependent on our ability to communicate effectively and our ability to reconcile and resolve conflict. We often enter into a conversation to prove a point, to give someone a piece of our mind, or to get them to do or be what we want. In other words, we deliver a message in a way that to them can feel like we’ve just thrown a hand grenade. When we add the fact that most of us don’t know how to listen well, we realize that we miss many opportunities to connect and even risk making the other feel neglected and disrespected. Dr. John Gottman tells us that we have as much as 90 percent chance for miscommunication, especially in close relationships (2001). So how do we cope with those unfavorable odds? Through acceptance, practice of active listening and realization that relational conflict is an opportunity for growth. An important component of relationship gridlock, according to John Gottman, is that usually both people feel criticized or rejected. There are always two points of view, both valid and right from within individual perception. The need to be right prevents us from actively listening to each other. When we fail to communicate a fundamental acceptance instead of a rejection of the other person’s personality, we are closed to all effective problem-solving (Gottman, 2001). Here are some practical activities from the Greater Good Science Center that can help you cultivate better relationships. For 15 minutes, take turns asking one another the questions in Set I and then move onto Set II and III. Each set of questions is designed to be more probing than the previous one. The 15-minute periods ensure that you spend an equivalent amount of time at each level of self-disclosure. Acknowledge the offense. Acknowledging the offense is an essential element of a good apology. Apologies are most likely to be well-received if you show that you recognize who was responsible, who was harmed, and the nature of the offense. Provide an explanation. In some cases, it’s helpful to explain an offense, especially to convey that it was not intentional and that it will not happen again. Express remorse. When you hurt someone, it’s natural to feel shame, humiliation, or remorse. Expressing these feelings communicates that you recognize and regret the suffering you caused. Make amends. A good apology should include efforts to repair the damage done. When considering how to best make amends, be sure to ask the offended person what would mean the most to them, rather than simply doing something to relieve your own feelings of guilt. To create the Time Capsule, compile the following items in a blank notebook, scrapbook, or folder on your computer. Skip any that don’t apply. A description of the last social event you attended. A description of a recent conversation with a friend. A description of how you met a new friend or acquaintance. The names of three songs you recently listened to. A recent status update you posted on social media. An excerpt from a recent paper or project for school or work. Store the Time Capsule in a place where you won’t see it. Set a reminder on your calendar to revisit it three months later. Once three months has passed, spend several minutes looking over your Time Capsule. Are you surprised by anything? Does anything strike you as particularly interesting or meaningful, looking back on it now? Take a moment to imagine your life in the future and focus specifically on your relationships. What is the best possible romantic, social, and family life you can imagine? Think about what your best possible relationships would look like for you. For the next 15 minutes, write continuously about what you imagined about these best possible future relationships. Be specific, creative and focus on the future. The collective phenomenon of happiness tells us that it is greater when shared as it magnifies the effects for everyone involved. Here are some suggestions for how to share your happiness exercise with a partner or a group, challenge yourself to be inspired and have someone to keep you accountable. Start your next meeting with recognitions. This can be verbal or written but be specific and describe the difference the person made to the group or project. Find a team building activity connected to making a difference. Impact 4 Good has an extensive list of options. Take your next meeting for a walk. Pair people up and give them specific questions to discuss and then regroup. Pecha Kucha presentation is great for team building and allows people to get to know each other outside of work by sharing pictures from their personal life before the meeting. Best Possible Future at Work. Take turns presenting on your vision of what you want to accomplish at work, say 3 years from now. Play a game like those from Happy Brain Science, known for their happiness boosting research-based games. FLIGBY Simulation Game is a powerful learning and consulting tool for improving leaders’ performance. Gratitude visit. A gratitude visit is an exercise where you write out a letter and deliver it to the person you want to express your gratitude to, but it can be expended into something you do in front of a group. Reflected Best Self is an exercise requires that you collect feedback about your peak performance moments from others around you and can be a great team building activity if shared. Mirror Image: Involves people in pairs, with one person mirroring the actions of the other. Stimulates self- and other-awareness. Human Knot. Starting in a circle, participants connect hands with two other people in the group to form the human knot. As a team they must then try to unravel the “human knot” by untangling themselves without breaking the chain of hands. This exercise promotes connection and collaboration. I Wish You Health and Happiness (an “experiment”). A simpler version of this exercise entails tallying up how many students are in a “positive” mood and how many are in a “negative” mood. On the chalkboard label the first column in a 2×2 cell the “before” column and place the tallied numbers in the vertically positioned “positive” and “negative” cells. Then instruct everyone in the room to shake the hands of five people while genuinely wishing them health and happiness. Afterwards, tally up the positive and negative moods again, and place those numbers in the cells under the “after” column. As the 2×2 cell reveals every time, this exercise alters participants moods quite effectively. Inner Sanctuary. Discuss what are some benefits/purposes of meditation? On a pre-printed silhouette of a human figure, use color and images to depict a place you can journey to during meditation, such as a natural scene, your religious faith or practice, a repeated phrase, a color or song, or a safe place. You can depict the sanctuary as being inside the body (preferred), or you can also depict the sanctuary around the figure. Title the page, “My inner sanctuary” and discuss times in your life you might need to retreat to your sanctuary. Joyful Memory. Everyone shares the most joyful memory that comes to mind. Each person directs the scene, casting group members in the various roles, including him or herself. Participant watches the scene and comments on the feelings and memories that come up. In addition to questionnaire, scales and assessments, there are several sources for worksheets aimed at building happiness. 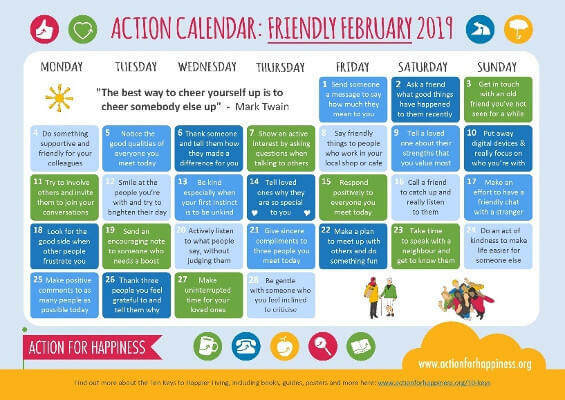 Action for Happiness published the ‘Happiness Challenge’ workbook which expends on the Happiness Action Pack and can be found here on their site. Happier Mind Journal offers free personal growth worksheets. 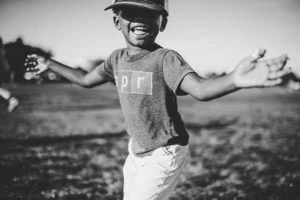 Even the Department of Health and Human Services publishes a happiness handout that contains Discovering Your Interests Worksheets and can be found at the link. Another website provides resources for therapists and contains a large number of worksheet as the one below, many of which address happiness boosting activities and can be found here. Many consider the Acceptance and Commitment Therapy as one of the most comprehensive and realistic approaches to increasing life satisfaction, and like all systematic methods it is not an easy fix. What differentiates ACT from other positive psychology interventions is its down to earth, whole person approach to alleviating metal suffering. According to Harris, pursuit of happiness can cause us much anxiety and sometimes deliver us into the hands of what we don’t want, namely the Happiness Trap (Harris, 2008). Our brain has evolved for our survival which often causes us to think and behave contrary to what brings real happiness and life satisfaction. We struggle with the negativity bias, the fight or flight responses, the entropy, and the many cognitive distortions our mind generate. We chase after pleasurable feelings, which are not lasting in nature, and this tendency make us vulnerable to the disappointment that arises when we encounter the other end of spectrum of human emotions, negative feelings and pain (Harris, 2008). The Acceptance and Commitment Therapy undermines this struggle by bringing our awareness to our tendencies to avoid pain, by arming us with techniques that combat cognitive distortions, by teaching us to be present for our immediate experience and accepting of reality, and finally by improving our chances at life satisfaction through cultivation of values. It is a path towards psychological flexibility that allows us to learn to love the life we already have versus chasing after some ideal that is always just outside our reach (Harris, 2008). The Happiness Trap is thinking that we can control our thoughts and feeling, that we must get rid of negative emotions, and that if we don’t, we are defective in some way because we erroneously believe that happiness is a natural state of being. We engage in all forms of control strategies known as experiential avoidance and fuse with our thoughts by believing that they are important and true, thereby creating our reality (Harris, 2008). “the ability to adapt to a situation with awareness, openness, and focus and to take effective action, guided by your values” (Harris, 2008, p.35). The Happiness Trap: How to Stop Struggling and Start Living: A Guide to ACT books comes with a set of worksheets which can be used as needed or in conjunction with the book. The Happiness Trap website also offers videos and scientific resources. Dr. Corey Keyes from Emory University who studied 3,032 participants found that only 17.2% of people were flourishing leaving 56.6% moderately mentally healthy, 12.1% percent languishing and 14.1% falling into the DSM criteria for major depressive disorder (2016). It’s no small undertaking to translate the science of happiness into practice but those who have managed to transform their search for happiness into a reflex of cultivating it at every opportunity can realize the potential of what positive psychology interventions have to offer. When we connect our values to our goals and pursue them with courage and grit, when we engage, connect, cultivate positivity, and when we build our legacy by adding value to people around us, accomplishments and success becomes a byproduct of a life well lived. Achor, S. (2013). Before Happiness: The 5 Hidden Keys to Achieving Success, Spreading Happiness, and Sustaining Positive Change. New York, NY: Crown Business. Biswas-Diener, R. (2010). Practicing Positive Psychology Coaching: Assessments, Activities and Strategies for Success. New York, NY: John Wiley & Sons. Csíkszentmihályi, M. (1990). Flow: The Psychology of Optimal Experience. New York, NY: HarperCollins. David, S. A., Boniwell, I., & Ayers, A. C. (2014). The Oxford Handbook of Happiness. Oxford, England: Oxford University Press. de Vries, M., Holland, R.W., Chenier, T., Starr, M.J and Winkielman, P. (2010). Happiness Cools the Warm Glow of Familiarity: Psychophysiological Evidence That Mood Modulates the Familiarity-Affect Link. Psychological Science, 21(3), 321-328. Diener, E., & Seligman, M. E. P. (2002). Very Happy People. Psychological Science, 13(1), 81-84. Gottman, J. M., & Silver, N. (1999). The Seven Principles for Making Marriage Work: A Practical Guide from the Country's Foremost Relationship Expert. New York, NY: Harmony Books. Kanter, J.W., Manos, R.C., Bowe, W. M., Baruch, D.E., Busch, A.M., & Rusch, L.C. (2010). What is behavioral activation: A review of the empirical literature. Clinical Psychology Review, 30(6), 608-620. Kifer, Y., Heller, D., Perunovic, W.Q.E. and Galinsky, A.D. (2013). The Good Life of the Powerful: The Experience of Power and Authenticity Enhances Subjective Well-Being. Psychological Science, 24(3), 280-288. Neff, K. D., & Dahm, K. A. (2014). Self-Compassion: What it is, what it does, and how it relates to mindfulness (pp. 121-140). In M. Robinson, B. Meier & B. Ostafin (Eds.) Mindfulness and Self-Regulation. New York, NY: Springer. Peterson, C. (2006). A primer in positive psychology. New York, NY: Oxford University Press. Peterson, C. & Seligman, M. E. P. (2004). Character strengths and virtues: A handbook and classification. New York: Oxford University Press. Rashid, T., & Anjum, A. (2008). Positive psychotherapy for young adults and children. In J. R. Z. Abela & B. L. Hankin (Eds. ), Handbook of depression in children and adolescents: Causes, treatment, and prevention (pp. 250–287). New York: Guilford. Seligman, M. E. P., Steen, T. A., Park, N., & Peterson, C. (2005). Positive psychology progress: Empirical validation of interventions. American Psychologist, 60, 410–421. Vallerand, R. J. (2015). The Psychology of Passion. New York: Oxford University Press. The Hedonic Treadmill – Are We Forever Chasing Rainbows? i learnt alot here. thanks so much.